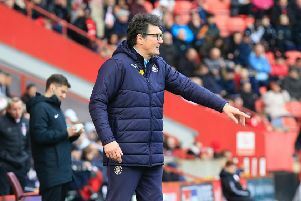 Luton Town eased to a 3-0 victory at nine-man Yeovil on Saturday with Danny Hylton scoring twice and Elliot Lee on target in a dramatic first half. Here’s how the Hatters rated. James Shea: 7.5 - Very quiet afternoon such was the lack of threat that came his way from the Glovers. However, made sure of a second clean sheet in three games with a quite brilliant save from a deflected effort late on. Jack Stacey: 7.5 - Like the rest of the Town defence, barely tested once Yeovil went down to nine. Had the freedom of the right flank to himself for long periods and blasted one effort over when well placed. Dan Potts: 8 - Got forward once again on the left hand side as Luton had plenty of joy when attacking in the first half, cutting the hosts open time and time again. Alan Sheehan: 8.5 - Captain was at his best throughout, dominating in the air to repel the Glovers whenever they went long. Kept things ticking over after the break as Town cantered to an easy victory. Glen Rea: 8 - Slotted into the back four comfortably as the visitors kept threats down to a bare minimum against a Yeovil team who had come into the game on the back of hitting six at Coventry. Confidence boosted from last week’s goal, he tried his luck from range a few times as well. Alan McCormack (STAR MAN): 8.5 - Bossed the midfield with his experience vital against a youthful Yeovil outfit. Too much for Zoko to handle as he saw red for an off the ball incident, while revelled in being the object of Glovers’ fans affections until earning a welcome breather late on. Pelly-Ruddock Mpanzu: 7.5 - Couldn’t quite repeat the heights of last week but didn’t need to as Luton were in control from very early on. Still played his part and almost netted, whizzing one effort over the top. Olly Lee: 7.5 - Made sure Town dominated the ball in the second period as they never gave Yeovil a sniff of getting back into the match. Good strike saw Hylton hauled down for the game’s crucial moment with Dickson off and the penalty tucked away. Elliot Lee: 8 - At the point of the diamond once more and he played the role excellently, bursting away to score with a clinical finish and teeing up brother Olly for the attempt that led to Town’s second. Lively after the break too as he linked play intelligently. Danny Hylton: 8.5 - Striker caused all kinds of problems for the Glovers defence once more. Great flick on for Lee to score, yanked back for the penalty which he dispatched with aplomb and cool finish to make it 3-0. Wisely taken off by Jones though with a red card on the horizon. James Collins: 7.5 - Lovely cross for Hylton to find the net and would have expected to add to his own tally in the second half with Town having a two player advantage. Denied by Nelson before chances dried up as the Hatters declared at three. Jake Jervis (SUB): 6.5 - Real chance to grab his first Luton goal with 45 minutes against nine men, but Luton dropped down the gears, happy with what they already had. Flynn Downes (SUB): 6.5 - On to protect McCormack from being dismissed and kept possession comfortably. Luke Gambin (SUB): 6 - Had the closing stages of the game.